Why? Go-brahmana-hitaya ca. This is to be noted. So according to Vedic civilization, special protection for children, brahmanas, women, and saintly persons, brahmana comes (under) saintly person, special... And cow. Special protection. Bala-dvija-suhrn-mitra. Others, next, just like we chant the mantra: namo brahmanya-devaya go-brahmana-hitaya ca. The first reference is given to the cows and the brahmanas. Why not others? There are so many animals, so many human beings. Why? Go-brahmana-hitaya ca. This is to be noted. Unless in the society these two creatures are taken care of, that is not human society. Lord Jesus Christ says, 'Thou shalt not kill,' and you are killing, expert in killing. And you are still Christian? This is king, that... Not that animals should not be given protection, only man should be given protection. No. Praja. Praja means one who taken birth in the kingdom. That is called praja. So animal is also American, man is also American, but there is no protection for the animal by the government. So that kind of government, rascal government, was not there. Equal right. Your country says equality given. Why not equality to the animals? That is defect. It is due to, I mean to say, absence of Krsna consciousness. A Krsna conscious person will not distinguish like that. For eating animal, they will philosophize that animal has no soul; therefore it can be killed. No. This is nonsense. Everyone has got soul. Even a small ant has got soul. But they have to kill. They have to eat. They are philosophizing different way. Lord Jesus Christ said, "Thou shalt not kill," and now they are interpreting, "Killing means murdering human being." But that is not in the Bible. Agriculture, cow protection. Nowadays, either brahmana or ksatriya or vaisya, practically everything is lost. Nobody is executing his occupational duties. Simply sudra, without any knowledge, without any enlightenment. Try to get some money and fill up your belly and go on sleeping, that's all. This is sudra-karma-svabhava-jam. Paricaryatmakam karma. Therefore sastra says kalau sudra-sambhavah. In this age practically 99.9% population are sudras, because they have given up, they have forgotten everything, what is the duty of brahmana, what is the duty of a ksatriya, what is the duty of a vaisya. Maybe some vaisyas are there and sudras are there. So unless there is development of God consciousness, this universal ideas, oh, these are nonsense. There cannot be. It is all false, jugglery of words. So first business is to understand your identity, identity of God, your relationship, and your action reformed in that way. Then there is question of universal, brotherhood, universal... Otherwise it is simply jugglery of words.If you are thinking of universal way, how you can give protection to a human being born in America, and send a cow to the slaughterhouse. What is your reason? Prabhupada: Universal means all. You have to love everyone. Guest: If I didn't love the cow as equally with a child, then it is a personal love because I'm defining qualifications. Prabhupada: But how can you avoid this personal? Prabhupada: But personal, child is the person. How can you avoid person? 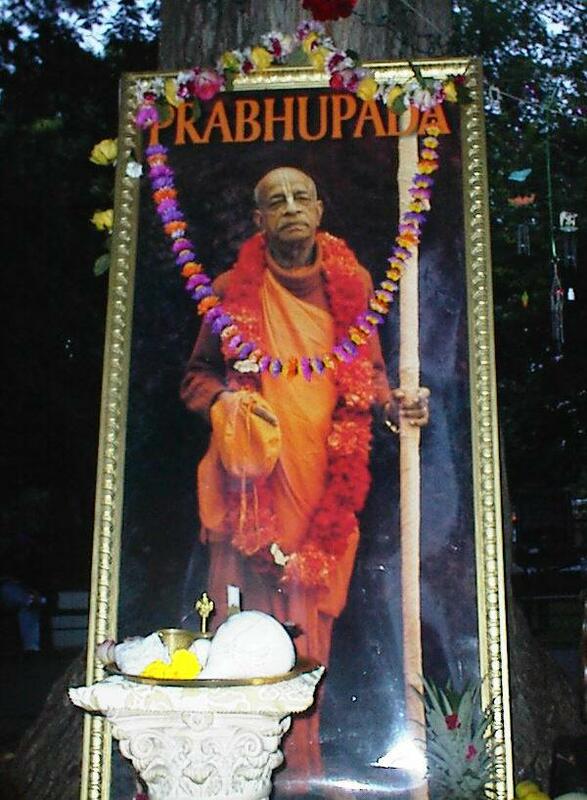 Prabhupada: How can you avoid person? When you love, how can you avoid a person? What do you mean by love? You cannot discriminate, "Oh, this is not universal. This is universal." Universal means all-including. So how you can avoid this person or imperson? You have to love everyone. That is universal. Prabhupada: No. Not limitation. The point is: if you love the root, then you love everything. Just like if you pour water on the root of the tree, then the branches, the flowers, the leaves, the fruits, and everything is nourished. So you have to know the technique, how to love the whole. If somebody is loving the tree--he is putting water in each every leaf, every branch, every flower--he is spoiling his time. Another intelligent man goes and he pours one bucketful of water on the root. Oh, it is distributed. This is foolishness, that without knowledge of the root, you want to love the branches. Your body. You love your body. Why do you supply your food in the stomach? Why not to the eyes, to the ears, to the nose? Why not individually, every finger, every hand, every part, every hair? No. As soon as you put the foodstuff to the stomach, the energy is at once distributed everywhere. Similarly, universal love means to love God. People are accepting Bhagavad-gita as something Indian or Hindu, but actually it is not. It is universal. Krsna says that there are so many forms of living entities. There are 8,400,000 different types of bodies. "And all of them are My sons." So if you love Krsna, then you love white man, you love American, you love European, you love Indian, you love cow, you love dog, you love serpent--everything. So you have to know the techniques. Simply by theoretical knowledge you cannot make any improvement. And these are practical examples. Because there is no love for God at the present moment, all this nonsense universal love, fraternity, are going to hell. Therefore we are interested in this Krsna consciousness movement. You have to change your consciousness, make it full with Krsna or God. Then everything will be all right. All right. Thank you. And if you kindly come and inquire in this way, we shall be very glad to answer as far as possible. So these two brothers (Jagai-Madhai) were creating disturbance in the, on the street, and there was a crowd. Lord Nityananda saw the crowd and inquired from persons, "What is this crowd?" Lord Nityananda and Haridasa Thakura were out for preaching. So people informed that "There are two brothers, most sinful, and they are creating disturbance. So there is crowd." So immediately Nityananda Prabhu said, "Why not deliver these two brothers immediately? Then it will be a great credit for Caitanya Mahaprabhu." This is preacher. He is thinking the credit of the master, not for himself. He risks his life. And the Jagai-Madhai brothers hurt Him on the head by throwing a stone. So blood also came out, but still, they said "All right, it is all right. You have hurt Me. Blood is oozing out. That doesn't matter. You chant Hare Krsna." That is preaching. Not that I remain safety and chanting Hare Krsna. No. We have to go out, meet the Jagai Madhai. That is Caitanya Mahaprabhu's mission. Because the world is full of Jagai-Madhai. So when Lord Caitanya Mahaprabhu became very angry because these people, these two brothers, injured Nityananda Prabhu, so He became firelike. So you should be firelike when a Vaisnava is insulted. Not that at that time trnad api sunicena, to become straw. No. You should be fire when Visnu and Vaisnava is insulted. So Caitanya Mahaprabhu showed this example. He became very, very angry: "I shall kill these two brothers immediately. Nonsense." So Nityananda Prabhu entreated,"Oh, My dear sir, this time You have promised not to accept any weapon. In Your incarnation as Lord Ramacandra, You took up weapon. As Krsna also, You took a weapon. But this time You wanted to deliver these poor souls. So don't kill them. Excuse them. Accept them." This is Nityananda Prabhu's business, guru's business. So Lord Caitanya simply asked them, "Now if you..." They also in the meantime fell down on the lotus feet of Lord Caitanya, that "We are so sinful. We have done wrong. Kindly excuse us." So Lord Caitanya Mahaprabhu made one condition, that "Your life is full of sinful activities. So if you simply promise that 'I shall not do anymore,' then I can accept you." So they said, "Sir, I'll not do. We'll not do anymore." Why is cow protection so much advocated? Because the cow is the most important animal. There is no injunction that one should not eat the flesh of tigers or other such animals. In the Vedic culture those who are meat-eaters are recommended to eat the flesh of goats, dogs, hogs, or other lower animals, but never the flesh of cows, the most important animals. While living, the cows give important service by giving milk, and even after death they give service by making available their skin, hooves, and horns, which may be used in many ways. Nonetheless, the present human society is so ungrateful that they needlessly kill these innocent cows. Therefore Krsna comes to punish them. "My Lord, You are the well-wisher of the cows and the brahmanas, and You are the well-wisher of the entire human society and world. "For perfect human society there must be protection of go-dvija--the cows and the brahmanas. The word dvija refers to the brahmana, or one who knows Brahman (God). When the demoniac give too much trouble to the brahmanas and the cows, Krsna descends to reestablish religious principles. sah--he (Kartaviryarjuna); vai--indeed; ratnam--a great source of wealth; tu--indeed; tat--the kamadhenu in the possession of Jamadagni; drstva--by observing; atma-aisvarya--his own personal opulence; ati-sayanam--which was exceeding; tat--that; na--not; adriyata--appreciated very much; agnihotryam--in that cow, which was useful for executing the agnihotra sacrifice; sa-abhilasah--became desirous; sa-haihayah--with his own men, the Haihayas. Jamadagni was more powerful than Kartaviryarjuna because of performing the agnihotra-yajna with clarified butter received from the kamadhenu. Not everyone can be expected to possess such a cow. Nonetheless, an ordinary man may possess an ordinary cow, give protection to this animal, take sufficient milk from it, and engage the milk to produce butter and clarified ghee, especially for performing the agnihotra-yajna. This is possible for everyone. Thus we find that in Bhagavad-gita Lord Krsna advises go-raksya, the protection of cows. This is essential because if cows are cared for properly they will surely supply sufficient milk. We have practical experience in America that in our various Krsna Consciousness Movement farms we are giving proper protection to the cows and receiving more than enough milk. In other farms the cows do not deliver as much milk as in our farms; because our cows know very well that we are not going to kill them, they are happy, and they give ample milk. Therefore this instruction given by Lord Krsna--go-raksya--is extremely meaningful. The whole world must learn from Krsna how to live happily without scarcity simply by producing food grains (annad bhavanti bhutani) and giving protection to the cows (go-raksya). Krsi-go-raksya-vanijyam vaisya-karma svabhavajam. Those who belong to the third level of human society, namely the mercantile people, must keep land for producing food grains and giving protection to cows. This is the injunction of Bhagavad-gita. In the matter of protecting the cows, the meat-eaters will protest, but in answer to them we may say that since Krsna gives stress to cow protection, those who are inclined to eat meat may eat the flesh of unimportant animals like hogs, dogs, goats and sheep, but they should not touch the life of the cows, for this is destructive to the spiritual advancement of human society. abhisecanikah--paraphernalia required for installing the Deity; bhumih--the land; aharat--collected; sakala--all kinds of; ausadhih--drugs and herbs; gavah--the cows; panca--five different varieties of products from the cow, namely milk, yogurt, clarified butter, cow dung and cow urine; pavitrani--uncontaminated; vasantah--personified springtime; madhu-madhavau--flowers and fruits produced during spring, or in the months of Caitra and Vaisakha. while giving protection to the cows, we can draw from them abundant quantities of milk; and by getting enough milk and combining it with food grains and vegetables, we can prepare hundreds of nectarean foods. It is also essential to give protection to the cows and take nectarean milk from their milk bags. brhaspatih--the priest of the heavenly planets; brahma-vade--in the matter of spiritual understanding; atma-vattve--in the matter of self-control; svayam--personally; harih--the Supreme Personality of Godhead; bhaktya--in devotion; go--cow; guru--spiritual master; vipresu--unto the brahmanas; visvaksena--the Personality of Godhead; anuvartisu--followers; hriya--by shyness; prasraya-silabhyam--by most gentle behavior; atma-tulyah--exactly like his personal interest; para-udyame--in the matter of philanthropic work. In his personal behavior, Prthu Maharaja exhibited all good qualities, and in spiritual knowledge he was exactly like Brhaspati. In self-control he was like the Supreme Personality of Godhead Himself. As far as his devotional service was concerned, he was a great follower of devotees who were attached to cow protection and the rendering of all service to the spiritual master and the brahmanas. He was perfect in his shyness and in his gentle behavior, and when he engaged in some philanthropic activity, he worked as if he were working for his own personal self. Also, like all Vaisnavas, Maharaja Prthu was devoted to cow protection, spiritual masters and qualified brahmanas. Prthu Maharaja was also very humble, meek and gentle, and whenever he performed any philanthropic work or welfare activity for the general public, he would labor exactly as if he were tending to his own personal necessities. In other words, his philanthropic activities were not for the sake of show but were performed out of personal feeling and commitment. All philanthropic activities should be thus performed. tat-tranaya--for the protection of the brahmanas; asrjat--created; ca--and; asman--us (ksatriyas); doh-sahasrat--from His thousand arms; sahasra-pat--the thousand-legged Supreme Being (the universal form); hrdayam--heart; tasya--His; hi--for; brahma--brahmanas; ksatram--the ksatriyas; angam--arms; pracaksate--are spoken of. For the protection of the brahmanas, the thousand-legged Supreme Being created us, the ksatriyas, from His thousand arms. Hence the brahmanas are said to be His heart and the ksatriyas His arms. Ksatriyas are specifically meant to maintain the brahmanas because if the brahmanas are protected, then the head of civilization is protected. Brahmanas are supposed to be the head of the social body; if the head is clear and has not gone mad, then everything is in proper position. The Lord is described thus: namo brahmanya-devaya go-brahmana-hitaya ca. The purport of this prayer is that the Lord specifically protects the brahmanas and the cows, and then He protects all other members of society (jagad-dhitaya). It is His will that universal welfare work depends on the protection of cows and brahmanas; thus brahminical culture and cow protection are the basic principles for human civilization. Ksatriyas are especially meant to protect the brahmanas, as is the supreme will of the Lord: go-brahmana-hitaya ca. As, within the body, the heart is a very important part, so the brahmanas are also the important element in human society. The ksatriyas are more like the whole body; even though the whole body is bigger than the heart, the heart is more important.